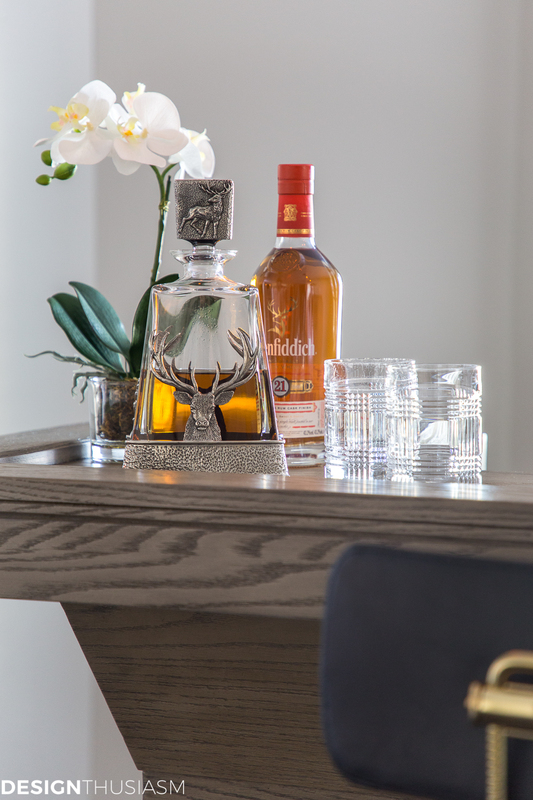 In this post: It doesn’t take much to set up an elegant home bar. 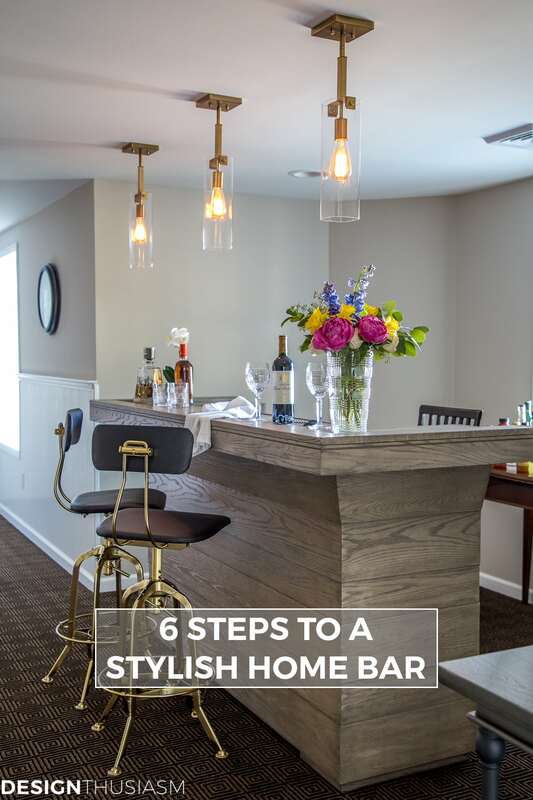 If you’re looking for home bar ideas, these 6 steps will help you set up a living room or basement bar. Can you look at a blank space and envision what could be? One of the most fascinating things for me is watching a small corner of a room come to life as the various design elements are put into place. Certainly it starts with a vision, but sometimes is a lot simpler than you might think. In the case of our home bar in an alcove of our basement, it actually only took 6 elements. 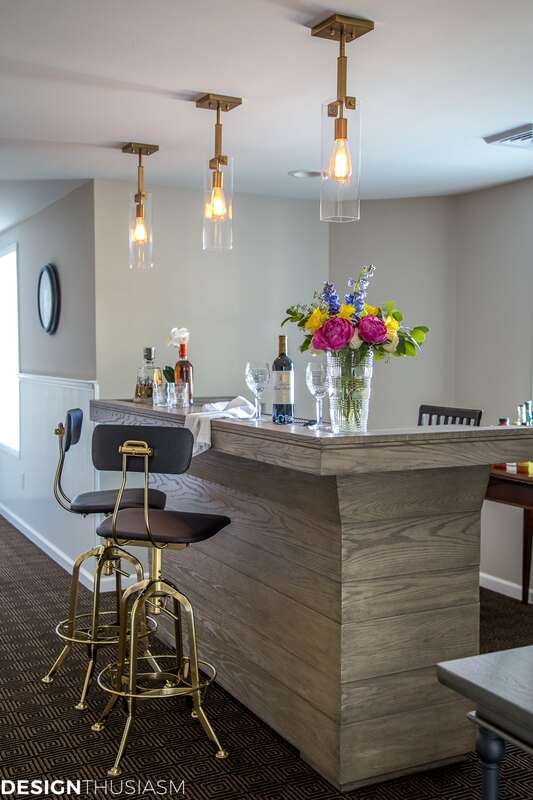 I’ve already talked about the renovation of our basement in a couple of prior posts, where I explained how we decided to claim this extra space and decorate it as nicely as you would any other room in the house. 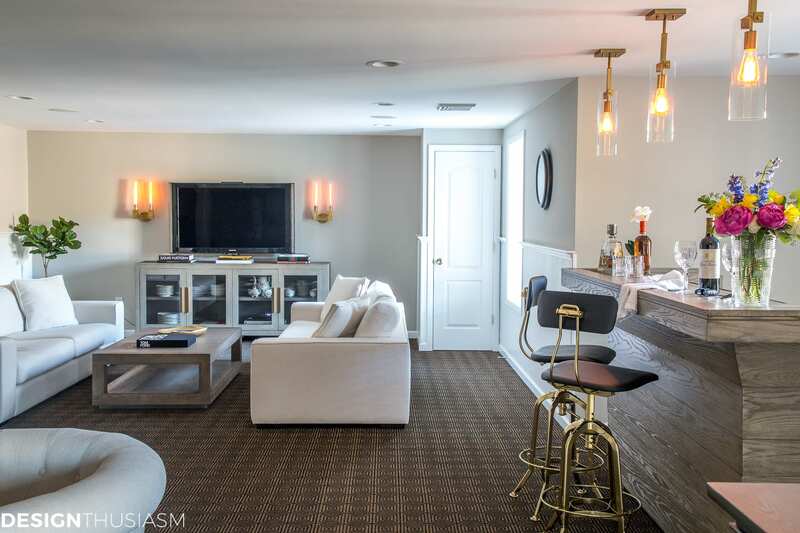 The goal is to use it as a large area for casual entertaining, so we’ve broken up the space into three distinct sections with two conversation areas flanking a bar in the center alcove. In these posts you can see the DESIGN PLAN and the first CONVERSATION AREA decorated. 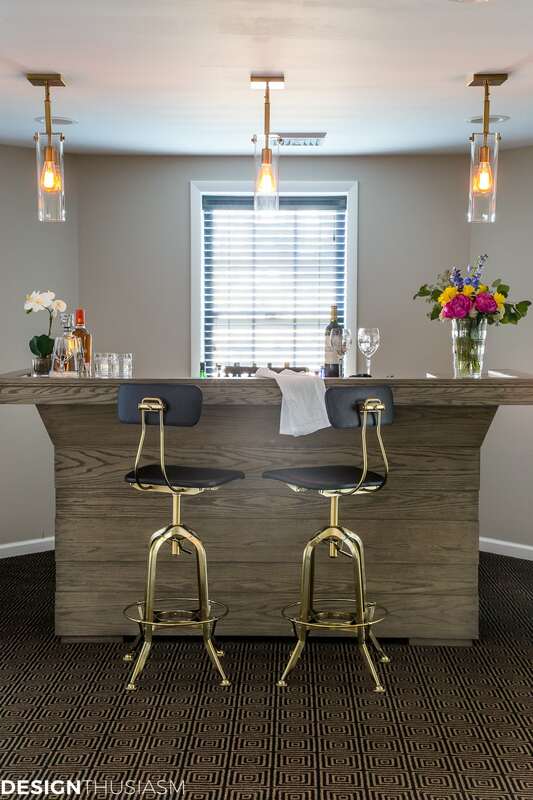 Now, let’s look at 6 easy steps to creating an elegant basement bar. 1. The bar – Obviously the first step is to select a bar. The are tons of options in all sizes and shapes and you need to select something that fits both your style and allotted space. I wanted a piece with clean lines that fit with the style I had established for this room that can best be described as rustic modern. I wanted an ash grey wood tone and room for glasses and bottles. It has a dry sink for ice and 2 cabinets that lock. While this is certainly the most important piece, its only one aspect of the entire puzzle. A naked bar without the right accessories around it will look more like a showroom than an inviting bar to enjoy celebrating with friends. 2. Decanters – Of course you can just plop a few bottles behind the bar, but it’s so much nicer to dress up your bar with a small array of collected decanters. You can find them in a range of prices and adding two or three to the bar gives it a nice finished touch. Fill them with your favorite spirits and use them as they were intended to be used. 3. 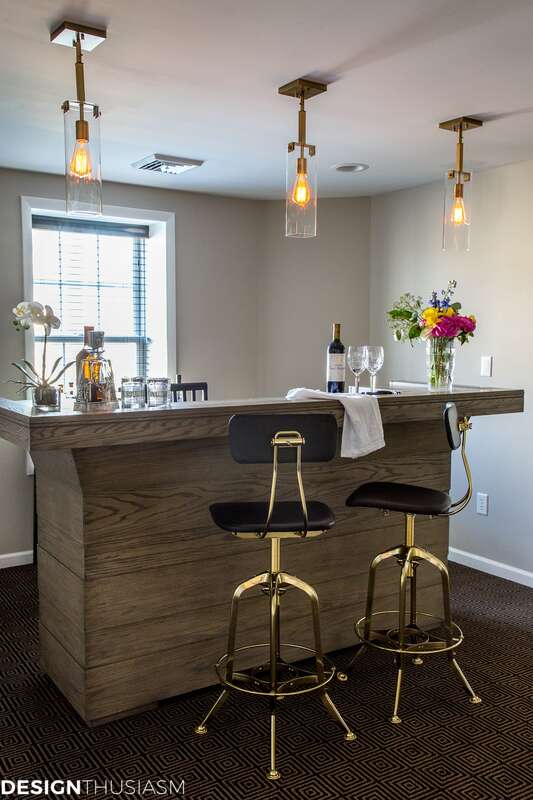 Bar stools – As important as the bar, or perhaps even more important is the selection of stylish bar stools. 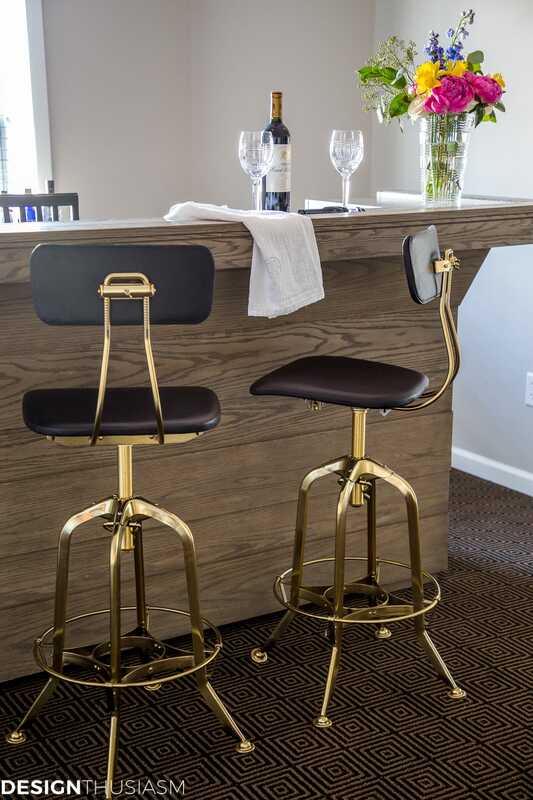 I chose to go with an industrial look and I love that our stools came with brass detailing. I wanted a statement bar stool to play off the simplicity of the bar, but you can also choose a cushy upholstered chair if that’s your look. This is a place where design is important because its the most “furniture-like” element of this small decorated corner. 4. A vase with floral arrangement – Much like the decanters, the opposite corner of our bar counter is adorned with a lush floral arrangement. Don’t underestimate the importance of this gracious note because it’s one of the things that brings the bar to life. This is an opportunity to add personality to the space and can be updated seasonally or as the event’s theme requires. 5. 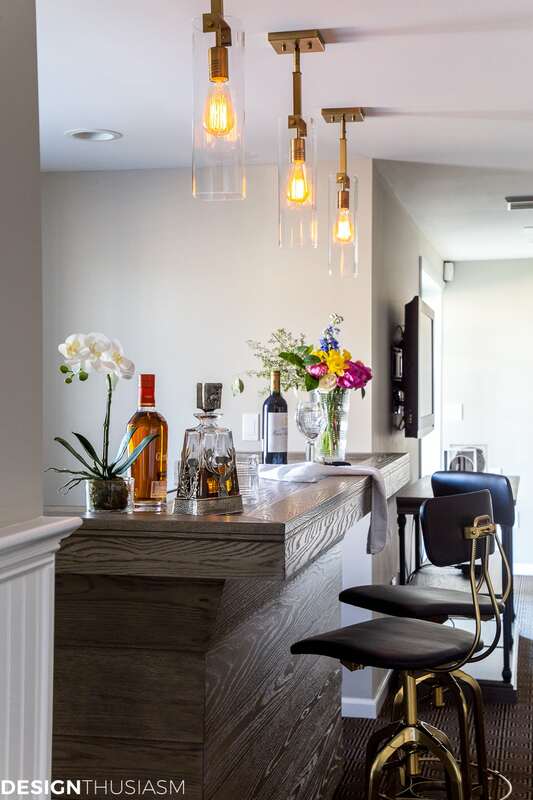 Lighting – The crowning touch of this bar alcove is the pendant lighting that spotlights the serving area. 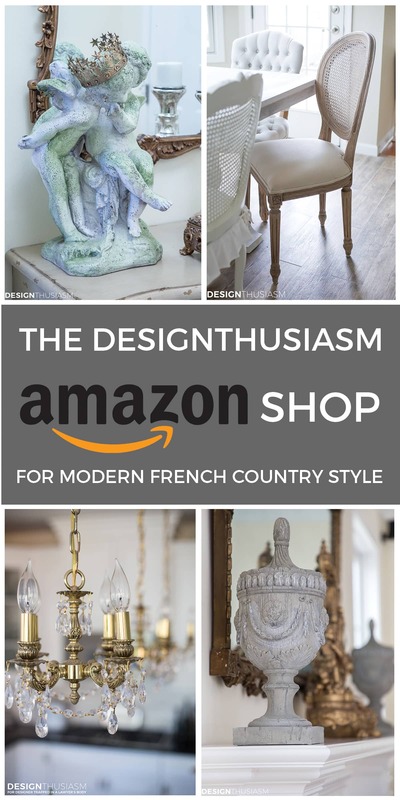 These wonderful pieces have an industrial feel and mirror the look of the sconces near the TV. They were a fraction of the cost yet have the same design spirit and were provided by my sponsor, 1StopLighting. Lighting adds the polish and finish that the space deserves. 6. 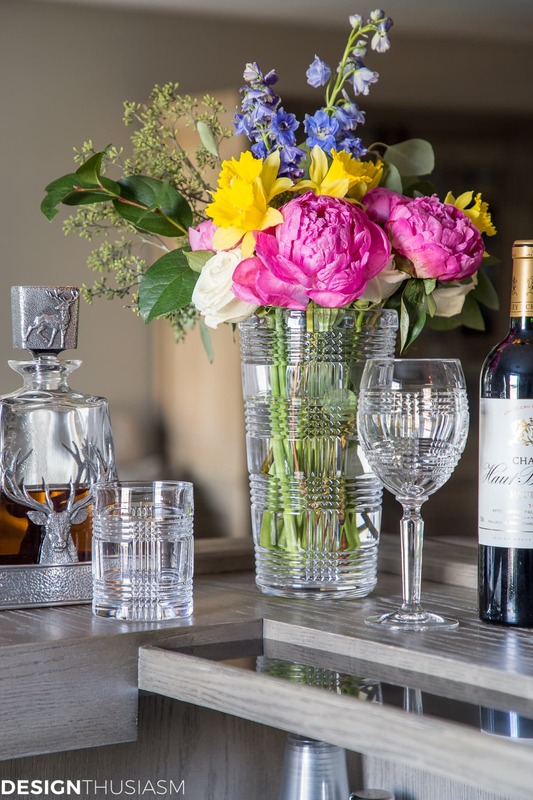 Glassware – If you truly want to add elegance to your home bar, it can be as easy as selecting awesome glassware. I use my favorite crystal barware in a glen plaid pattern which I have in several sizes including wine goblets, champagne flutes, high balls and double old fashioned. I’ve got my eyes on the decanter to add to my collection next. This alcove is the smallest section of a pretty large room but it’s become the heart and soul of it as bars often do. 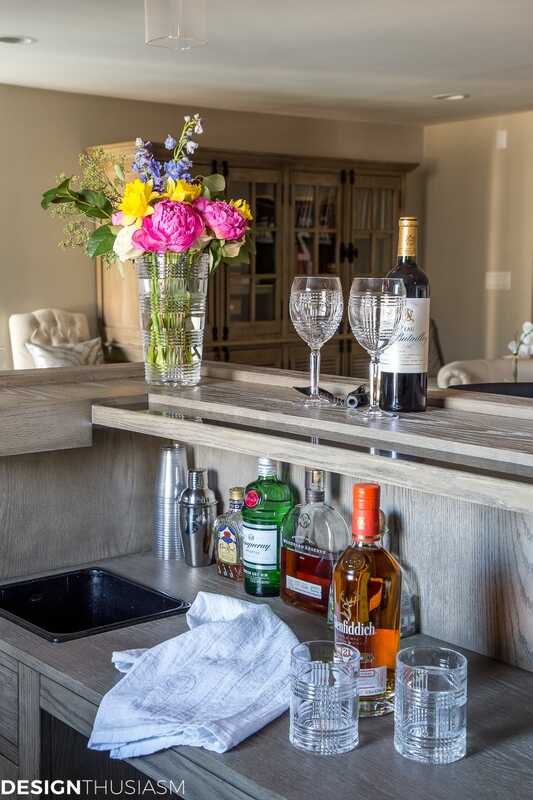 Much like a kitchen island, it’s where your guests will congregate, and decorating it with panache helps you enjoy it all the better. The fact that it can be done in 6 easy steps, makes it a pretty simple effort that goes a long way! 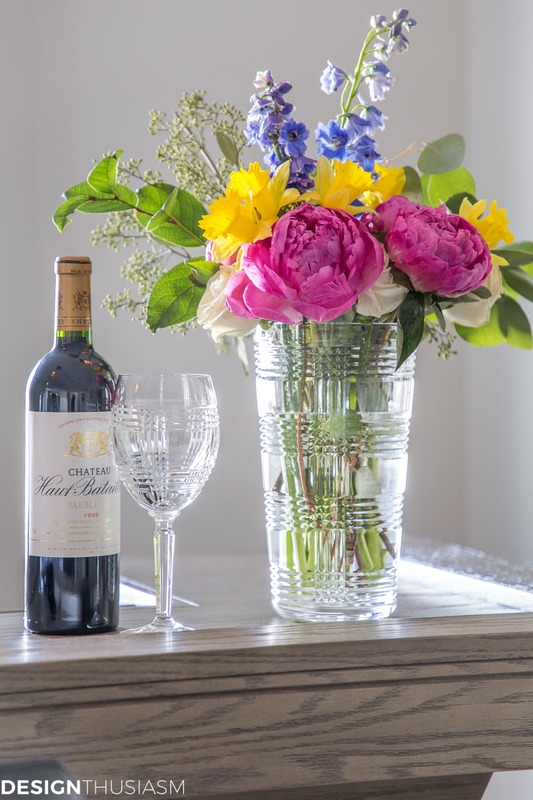 Pour me a glass of that wine…I’ll be right over! Simple and elegant! Looks fabulous! 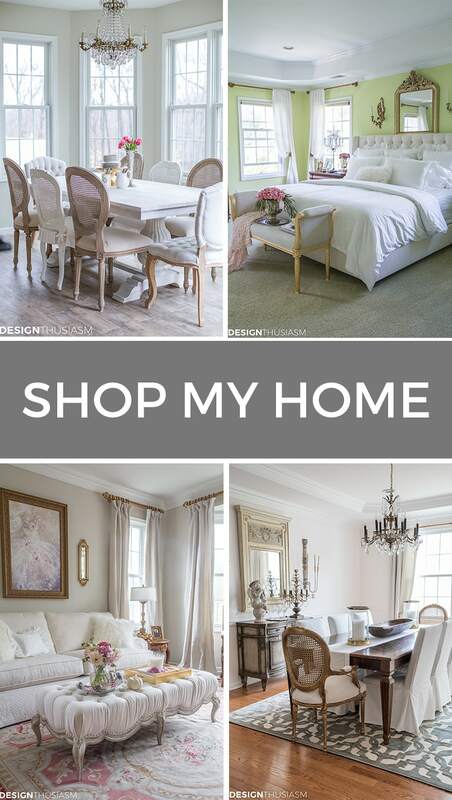 I’d love to be at a party in your house! I just love your stags head decanter. It looks relaxed and inviting with a touch of elegance. It’s time for refresh in my butler’s pantry/bar area. Thanks for the inspiration.